What are the types of campaigns in Route? When should I use an automation campaign? When should I use a broadcast campaign? A campaign aligns all of your marketing channels around a single offer and goal. Campaigns help attract and generate traffic, leads, and ultimately customers. You can run a campaign for launching your new product, new offers and promotions, announcements, events, etc. Determine the goals for your campaign – Identify what exactly are you trying to achieve with your campaign. Create a buyer journey map aligned with your campaign goals. Identify and understand your target audience – Research your target audience to understand their problems, needs, as well as to find out which channels to use to reach out to them. This is nothing but a buyer persona, which will help you understand your ideal buyer and decide what stage of the buyer journey does a particular lead fits in. Create an irresistible offer that would appeal to your target audience – Based on the lead’s needs and position on the buyer journey map, you can create a relevant offer. 1. 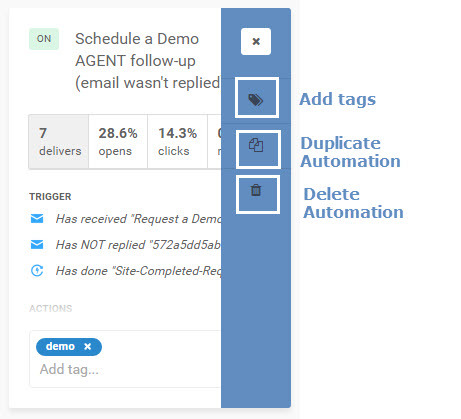 Automations – An automation is a campaign that will perform automated tasks such as sending messages (e.g emails or SMS) to contacts or sending contact data to other services via Zapier or to Pipedrive using our custom integrations. It consists of a series of actions that are performed when certain conditions are met. All you need to do is set triggers and define actions and then let Route do all the work for you. To open the Automations menu in Route, click on Campaign. It will display two options – Automations and Broadcasts. Click on Automations and the Automations menu will be displayed. The Automations menu in Route displays a list of automations that you’ve created with a short summary of the automations. These include performance metrics such as delivers, opens, clicks, and replies, triggers set off, and actions performed. You can search for a particular automation using the Search Bar. Alternatively, you can filter your automations as per their corresponding tags using the Tag Filters option. You can also change the Automations View to see all automations at once, just the enabled automations, or just the disabled automations. 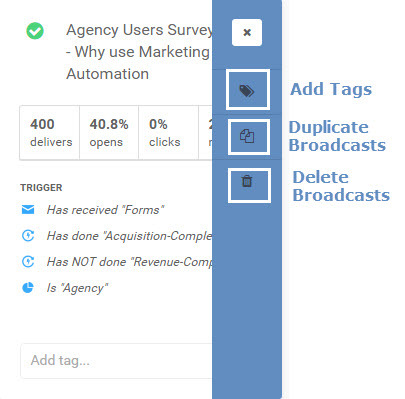 You can also Add Tags, Duplicate Automation, or Delete Automation altogether. If you wish to view further details on the automation, just click on an automation that you want to view. 2. 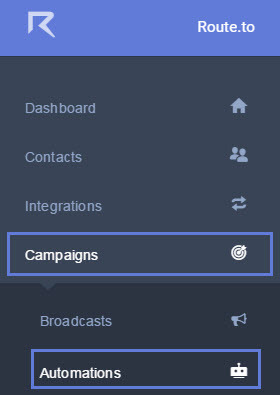 Broadcasts – A broadcast campaign lets you send mass email marketing messages, SMSes and perform any action in bulks. It is a one-time scheduled campaign and doesn’t contain a series of actions to be performed. Also, the messages are sent manually and you have to schedule a specific date and time to start the broadcast. 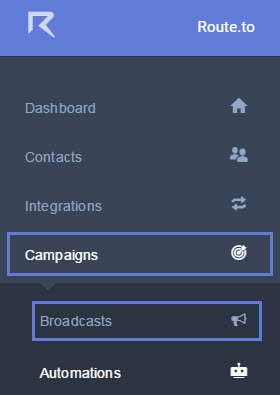 To open the Broadcasts menu in Route, click on Campaign. It will display two options – Automations and Broadcasts. Click on Broadcasts and the Broadcasts menu will be displayed. The Broadcasts menu in Route displays a list of automations that you’ve created with a short summary of the automations. These include performance metrics such as delivers, opens, clicks, and replies, triggers set off, and actions performed. You can search for a particular broadcast using the Search Bar. You can also change the Broadcasts View to see all broadcasts at once, just the enabled broadcasts, or just the disabled broadcasts. You can also Add Tags, Duplicate Broadcasts, or Delete Broadcasts altogether. If you wish to view further details on the broadcast, just click on a broadcast that you want to view. Use broadcasts when you have to send newsletters, general announcements, or any kind of one-size-fits-all message via email or SMS. You can also use broadcasts to perform other tasks such as sending contact information to a CRM. This is because unlike automations that consist of a series of actions, broadcast campaigns consist of just a single action. It takes place once and that’s it. Next: Learn more about creating Automation campaigns in Route.